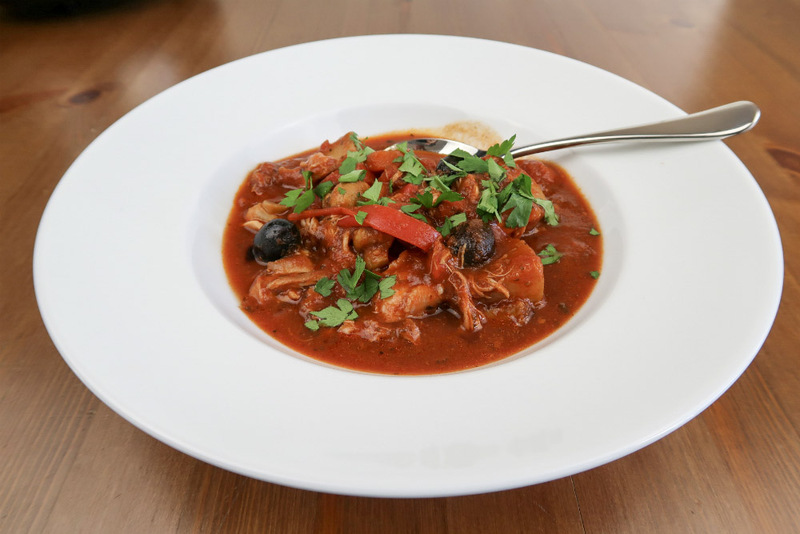 Come home to a steaming bowl of Chicken Cacciatore for dinner, with this easy recipe for your slow cooker or crockpot. Chicken Cacciatore is a delicious meal, with big flavours and a rich tomato sauce. Usually it would need a long slow simmer on the hob or in the oven, with regular checks. But with a slow cooker or crock pot you can prepare it quickly in the morning and then just finish everything off when you get home in the evening. A slow cooker is ideal for busy people, because you can just leave it to cook dinner while you get on with everything else you have to do. And there are lots of other benefits as well, click here to read more about why you need a slow cooker in your kitchen. Because I’ve added some new potatoes into this recipe for Chicken Cacciatore, makes it an easy one-pot meal. You could just serve it with some crusty bread, ready for dipping into the delicious sauce. Or of course, feel free to serve it with some pasta or rice if you prefer. I cooked my Chicken Cacciatore in my VonShef 3.5 litre slow cooker*. It’s a great family sized slow cooker, ideal for cooking 4-6 portions. Flat leaf parsley to serve. Put the slow cooker pot in place on its base. Cut the new potatoes in half, or into four if they are particularly large new potatoes. Spread them evenly over the base of the slow cooker pot. Peel the carrots and cut them into slices around 3mm thick. Spread the slices of carrots over the potatoes in the slow cooker pot. Peel the onion and slice into thick slices, and peel and finely chop the garlic cloves. Then add these to the slow cooker pot on top of the carrots and potatoes. Trim the chicken thighs to remove any excess fat, and cut each thigh into four pieces. Place these on top of the vegetables in the slow cooker, and then sprinkle over a pinch of salt, a good grinding of black pepper and the dried herbs. Note: If you have a little extra time, you could fry the sliced onion in a little oil before adding it to the pot to increase the flavour. You could also brown the pieces of chicken thigh in a frying pan if you wish. Add the tomato puree and crumble in the stock cube, then add the chopped tomatoes. Mix together the passata and red wine in a jug. If you prefer not to use alcohol in this recipe, you can replace it with water. Pour the mix over the contents of the slow cooker, and give it a gentle stir. Make sure that the vegetables are all covered by the liquid though, so that they cook properly. Put the lid on the slow cooker and switch on. Cook on High for 3.5 hours or Low for around 8 hours. Then remove the lid, and stir in the mushrooms and olives. Cook on High for a further 30 minutes, then sprinkle with chopped parsley and serve. Thank you very much for sharing this recipe, I plan to cook this delicious looking meal for my family on friday evening :) i will let you know how it goes. I hope you enjoy it, Lindsey! Mmm I love the rich colour of your chicken cacciatore, it looks perfect for autumn. Pinning to my slow cooker board! This is ideal for the Slow Cooked Challenge linky on my blog if you ever fancy joining in. Ooh, thanks – I’ll take a look at that! It’s yummy, I might make it for dinner tomorrow! Wow, that photo made my mouth water. If it’s as tasty as it looks, it’ll be absolutely delicious. Really need to try the recipe now.